Like an egregious make up call it’s time for some random musings of the last week to catch us all up. Let’s do it with some movie quotes. 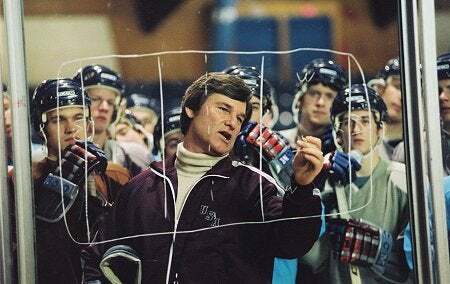 Herb Brooks: The Soviets win because they take that talent and use it inside a system that's designed for the betterment of the team. John Buccigross’ comparison of the Red Wings to the Red Army is a good one. We saw just how effective the Red Wing’s system was in games one and two. Osgood was solid in goal but was not all that tested with the Red Wings defense, anchored by Lindstrom, holding the Pens to 19 and 22 shots in the two games respectively. They killed thirteen straight penalties and even notched a short handed goal. On offense, 6 players combined for the Wings 7 total goals (each had at least one assist). Robin Hood: Blinkin! What are you doing? Blinkin: Guessing. I guess no one's coming. It was the week of missed home runs calls and its become more obvious to me than ever that its time for instant replay in baseball. After Delgado’s missed home run, fans could see that it clearly was a fair ball before Willie Randolph and Joe Girardi reached the umpire to argue. Take a page from the NHL (just one page though, please) and institute video review for home run calls only. It’s a slippery slope some say. What about trapped balls? What about balls and strikes? They can equally have an affect on the game. This may be true, but the NHL has made it work (and they too have had issues with game times). There are penalties that are not penalties and pucks that may have deflected out of play. These plays also can affect the outcome of the game, but fans and players understand that the line must be drawn somewhere. For the NHL, it’s goal or no goal. For the MLB, it should be home run or no home run. Buster Olney gives some great insight as to how the system could work here. Oliver Queenan: We have a question: Do you want to be a cop, or do you want to appear to be a cop? It's an honest question. A lot of guys just want to appear to be cops. Gun, badge, pretend they're on TV. Being in Boston, you just have to do some Departed lines. It’s amazing the staties really do have the thickest accents. While trying to J-walk after the semi-finals game on Saturday, the statie asked me and the boys, “What is this frog-ah?” Funny stuff. Anyway, the Johns Hopkins B-team who was 0-5 this year showed up and Syracuse showed them who was boss to win the national championship. Syracuse’s intense play combined with Hopkins’ countless mistakes gave ‘cuse an easy win. Credit ‘cuse and Hopkins for great games in the semi-finals both pulling upsets against favorites Virginia and Duke. Also, credit Duke fans for chucking a Diet Coke at my head. Bruce Wayne: How about Mr. E.? Bruce Wayne: Mr. E. Nygma. Edward Nygma. That’s pretty much what it comes down to for the Yankees. Derek Jeter is off to a good year offensively and then plays the worst came of his career against Baltimore on Tuesday. Jason Giambi is flirting with the Mendoza line and then hits not one but two balls into the Chesapeake Bay. The Yanks sweep the Mariners and then nearly get swept by the Orioles. Joba Chamberlin is getting converting to a starter and Ian Kennedy hits the 15 day DL. Ladies and gentlemen, I am out of answers. Phil Weston: Don't be afraid to throw the elbow. lf you break someone's collarbone, that’s a good thing. The Pens finally came to play in game 3, and it made for a great game. The intensity was unmatched. There were over 20 hits by my count, 6 of which may have happened over a period of three minutes. The Pens finally abandoned the dump and chase method that wasn’t working and started attacking Chris Osgood. The Red Wings defense is good, but its hard to make a play when Crosby, Hossa, and Dupuis are streaking up the ice at you. The Pens goal scoring was not always pretty, they were able get in close and get the puck across the line. Crosby’s first goal was a great example of this. It was reported that Cubs management instructed security guards to have no tolerance for those booing or cursing Cubs left fielder Alfonso Soriano. The Cubs deny this claim, stating that ballpark rules have not changed. C’mon! How does someone make something like that up!? Maybe if Soriano didn’t blow the game for the Cubs on Sunday such measures would not have to be taken.